Dancer's pose, or natarajasana in Sanskrit, is a standing balancing posture that builds both strength and flexibility. It's most commonly practiced in vinyasa classes. 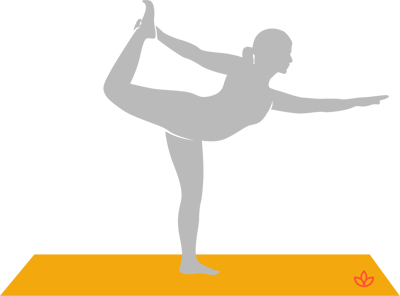 Standing on one foot, the yogi clasps the other foot behind them in a bow shape. From standing, exhale and lift the right foot near the buttocks. Clasp the ankle with the right hand. Inhale and reach the left arm forward. Exhale and stretch the right leg up and back, lifting the toes as high as is comfortable.